Western producers are finally giving a trio of Alsatian-style wines the attention they deserve, turning out bottles that rival better-known varietals. The kicker: These fruity, aromatic sips pair beautifully with the season’s tricky-to-match foods. Poor Riesling is the victim of a reputation earned decades ago, when much of it in the West was made in a sweet German style but without that country’s characteristic acidity for balance. The result was a syrupy starter drink, something to put behind you when your palate grew up. Come back now, though, and you’ll find far more balanced versions. Some are truly bone-dry; others have a bit of sweetness. (Many are using a scale on their label indicating the level of dryness or sweetness, so you know what you’re getting.) The best ones are grown in places where they retain the variety’s natural crispness. Add to that honeysuckle and jasmine aromas; green apple, stone fruit, and citrus flavors; minerality and nuttiness–and you have one of the world’s great food wines. 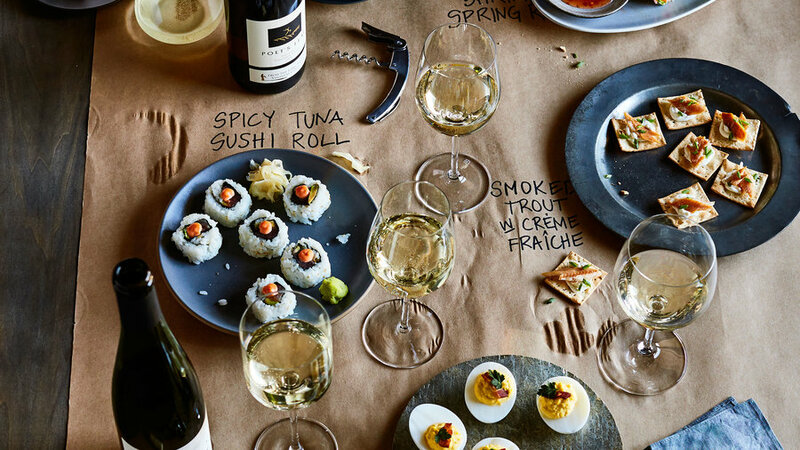 On the Table: Dry Rieslings are just the thing for wine-challenging egg dishes–deviled eggs, quiche–and fried seafood (like a shrimp po’boy drizzled with spicy aioli). Off-dry bottles handle the likes of spicy sushi and a broad range of other Asian dishes, from Chinese chicken salad to mango shrimp. If you stick your nose in a glass and get nothing but a tangle of flowers–honeysuckle, roses, lavender–it’s Gewürztraminer. Just Gewürz for short. Beyond the bouquet is some mix of green apple, peaches, citrus, litchi, wet-stone minerality, and spice. (Gewürz means “spice or seasoning” in German.) The best Gewürztraminers–whether bone-dry, as more are now, or left with a tiny bit of residual sugar–are balanced with lip-smacking acidity that keeps the fruit and flowers in check. On the Table: The exuberant aromatics of this wine love herb-rich Vietnamese dishes, island flavors like poke, and Indian curries and grilled meats like tandoori chicken (clinch the deal with mint raita). The most obscure of the trio, this relative of wine darling Pinot Grigio (the same grape as Pinot Gris) is also the most subtle. Less exuberant on the nose, it leans to almost Chardonnay-like, with apple, pear, and citrus notes. But its rich mouth-feel is offset by tart stone fruit, delicate florals, lovely crispness, and stoniness. That underlying minerality is an asset when it comes to sipping with food. On the Table: The sausages and cured meats of Pinot Blanc’s home turf in Alsace are terrific partners, as is a rich French croque monsieur. We’ve found it has a wide range, though, also standing up to smoked trout, Thai coconut curry, even green chile pork stew.